PermaFrost edits Frost’s appearance by giving him white textures, a frosty aura and glowing eyes so that Frost will finally look a bit more like his namesake. 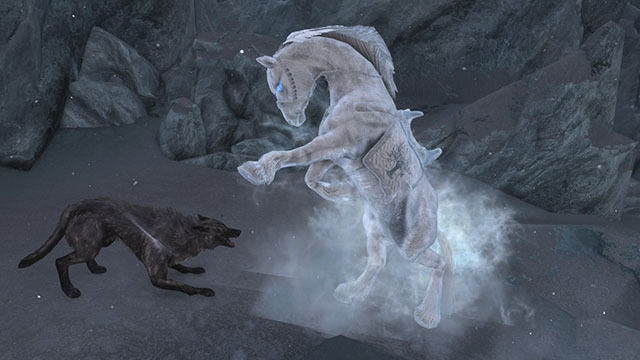 [*]It replaces Frost’s textures and meshes, applies a chilly aura to the horse and makes his eyes glow. [*]It sets Frost to essential status so that he won’t die. He’s now a permanent Frost…PermaFrost. [*]It gives Frost his own stand-alone horse saddle for maximum compatibility. [*]It edits “Frost’s Identity Papers” so that it will correctly describe Frost as a “white” horse instead of the “mealy chestnut” description in vanilla. [*]It allows Frost’s level to scale with the player – Frost will now have more health at higher levels unlike the vanilla Frost. [*]It ensures that Frost will not break the player’s stealth when sneaking and sets him to not “report” any crimes that your character commits. [*]It sets Frost to only be aggressive in fights against weaker enemies and grants him a frost cloak spell that activates during combat and damages enemies within range. [*]It gives Frost a 100% resistance to frost, but with a 100% weakness to fire. [*]It grants Frost complete immunity to fall damage. [*]It gives Frost a 100% poison and disease resistance. [*]It grants Frost the ability to water walk and a few spells to fight enemies. [*]It adds a few of the stealth perks for good measure and the quiet casting perk for his abilities and spells. [*]It grants him a few bonus stats for better survivability like extra armor, health, health regen, damage reflection and spell absorption. [*]It increases Frost’s speed by 50% and gives him some extra stamina to sprint for longer periods of time. Stamina regen was also increased to reduce the downtime between sprints. [*]Frost enters the “Hypothermia” state whenever rain falls. 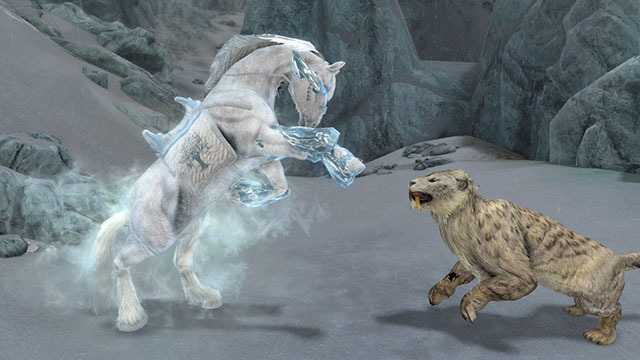 The Hypothermia state will be indicated by an accumulation of ice on Frost’s hooves and body, it will appear soon after rain begins to fall from the sky, from that point onward Frost will gain a 12.5% speed bonus (a net 62.5% bonus speed) and some extra stamina to help “increase” Frost’s speed further via sprinting. Tip: Players can strategically use the Storm Call shout to trigger rainfall which would in turn transform Frost into Hypothermia. Hypothermia will also boost his skills at melee combat. [*]Frost enters the “Hoarfrost” state whenever snow falls. The Hoarfrost state will be indicated by an accumulation of snow on Frost, it will appear soon after snow begins to fall from the sky, from that point onward Frost will gain a 25% bonus speed (a net 75% bonus speed) as well as some extra magicka to cast his spells. The bonus speed will be a boon to those who use survival mods like Frostfall that make snowy weather deadlier. Hoarfrost also increases the effectiveness of Frost’s spells. [*]Give him overpowered stats to instantly kill his enemies. Install the mod virtually with your preferred mod manager or copy and paste the contents of the zip files into the Data directory. Please note that you can only use any ONE of the three main files, any ONE of the saddle mesh replacers and any ONE of the Frost mesh replacers. The differences between the main files are purely cosmetic; each main file will have all of the aforementioned bonuses and features. Install the mod just as the section above describes. For midplaythrough installs of this mod, the changes to Frost should immediately take hold even if you already obtained Frost before. If for whatever reason the saddles didn’t update then don’t panic – go to an interior cell like a house (any cell that the horse isn’t sharing with you should do), press the tilde key (~) and type in “pcb” (just pcb without the quotation marks) and press ENTER – after doing this Frost will finally have his modded saddle equipped. Instead of using the pcb console command to “force” Frost to equip the new saddle, you can just continue your adventures in Skyrim or fast travel across the map a couple times, doing this will force the game’s engine to “update” Frost’s saddle for you automatically. You can update the mod by reinstalling it with the updated version through your mod manager or by manually deleting the mod and installing it again with the updated version. Changes should take hold immediately after applying the update. Follow the tips outlined in the “Mid Game Installation” section above if Frost’s appearance doesn’t update immediately. Uninstall the mod manually from the Data folder or virtually with your mod manager. The mod doesn’t have any scripts or persistent objects, so it is 100% safe to remove at any time. In addition to playing around with the load order to fix conflicts, certain mods (like those which add new perks, factions or spells to Frost) can be made even more compatible via the use of a Merged Patch, a Bashed Patch and/or a Smashed Patch. What will happen if I just load the conflicting mod before PermaFrost? All of the new perks, factions or spells added by the conflicting mod won’t be carried forward (or won’t be given to Frost in-game). See the next section below for more details on those three patches and how they can help transfer those bonuses over to Frost (if you really want Frost to have them). [*]Mod Organizer 2 will give you better flexibility when installing this mod and its optional files. Other than being able to virtually install mods (installing them safely outside of the Data folder thus keeping the Data folder clean), it gives you the ability to choose which assets from one mod will overwrite the assets of another mod – a feature which will make customizing Frost with this mod’s optional files a lot easier. [*] A Merged Patch created with TES5Edit is recommended to increase compatibility with mods that adds certain attributes to Frost like perks or keywords. You can learn how to create a merged patch here. Hint: A merged patch can preserve perks, keywords, factions and more that would otherwise be “lost” to mod conflicts, fixing these can lead to better consistency in-game, fix minor bugs and even crashes with certain script mods. [*] A Bashed Patch created with Wrye Bash could improve the likelihood of items, that were added to Frost by other mods, becoming available even if PermaFrost.esp overwrites the conflicting mod, provided that the mod author added them to the appropriate leveled lists. You can learn how to create a bashed patch here, while it may not be necessary for this mod it can be handy to create one for your load order for better stability with your weapon and armor mods. Hint: A lot of the crashes that players tend to experience when bartering with merchants, opening NPC inventories and containers, or even just exploring Skyrim (during the spawning of certain NPCs in dungeons or random encounters) can be fixed with a Bashed Patch. [*]A Smashed Patch created with Mator Smash can also be used, it can eliminate the need of creating both a Bashed Patch and a Merged Patch and in many ways is more effective than either of those patches. You can learn how to create one here.